TAG Heuer's latest smart watch collection, the TAG Heuer Connected Modular 45 allows you to fully customise your smart watch with interchangeable straps and lugs. 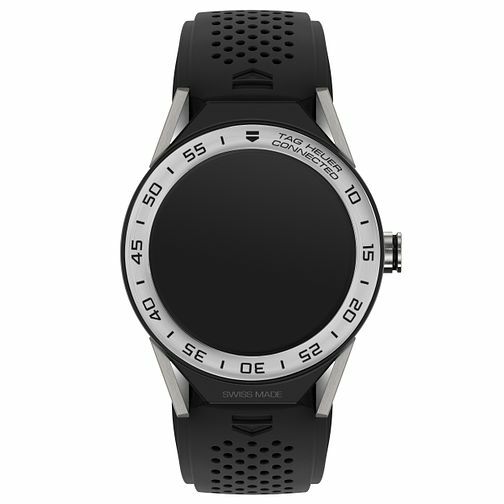 The first Swiss made connected watch modular, with all the features you would expect from TAG Heuer connected as well as significant updates including NFC payment function, updated GPS and improved battery life. Operating on the very lastest Andriod wear 2.0 technology to pair with your Android or IOS devices. This model is crafted from Titanium with a steel bezel and black rubber strap for a sleek and sophisticated finish. Not compatable with TAG Heuer Connected first generation chargers.